I have been refighting the Second World War my entire life. My campaign began with the board game Axis and Allies and continued on the computer with Panzer General and Close Combat. I spent hours as a teenager designing scenarios for the war in Civilization II, with a computer mouse in one hand and my history textbook in the other. 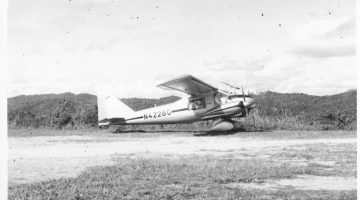 I particularly enjoyed creating scenarios in which the player had to run an airlift over enemy territory in order to resupply a beleaguered city – allowing me to relive my grandfather’s stories about flying over the hump. Perhaps this pastime reeks of warmongering, but I’ve always looked at it as glorified puzzle solving with a dash of history. I didn’t know it at the time, but these gaming experiences represented my first foray into historical research: I checked out books from the public library on particular campaigns so that I could provide the proper context and I studied my father’s world atlas to make sure I had the topography correct. I didn’t just want to have fun. I also wanted to get it right. Shenandoah Studio is also interested in getting it right and having fun at the same time. Their game, Battle of the Bulge, is a strategic simulation of Germany’s surprise counteroffensive in 1944, which was called the “Battle of the Bulge” because of the bulge the campaign created in maps of the frontline at the time. The battle represented Germany’s last attempt to salvage the war before their country was completely encircled. The second half of 1944 found German troops in steady retreat as American and British forces broke out from the Normandy beaches, while the Soviet army completed successful campaigns into the Baltic States, Poland, and Romania. The German high command, however, had yet to give up hope. They believed that a settled peace with America and Britain could still be achieved with one decisive victory on the Western Front. While Allied forces rested for a new campaign in spring 1945, the German army quietly collected troops and supplies for a surprise attack. The plan for the German offensive was twofold. First, the German high command hoped to capture the Belgium city of Antwerp – a major supply port that the Allies intended to use during the invasion of Germany. The Allied army possessed a significant advantage in men and material by the winter of 1944, but they still relied on resupply from ports in western France. This left their supply lines dangerously long and vulnerable to attack. Second, in the process of taking Antwerp, Germany hoped to drive a wedge between American and British forces on the Western Front. The path of the offensive would take German forces through the Ardennes Forest, which lay roughly at the point where American and British forces met on the other side of the lines. German generals believed they could encircle one or both of these forces during the offensive, a move that would encourage division between Allied leaders and lead to a peace settlement. 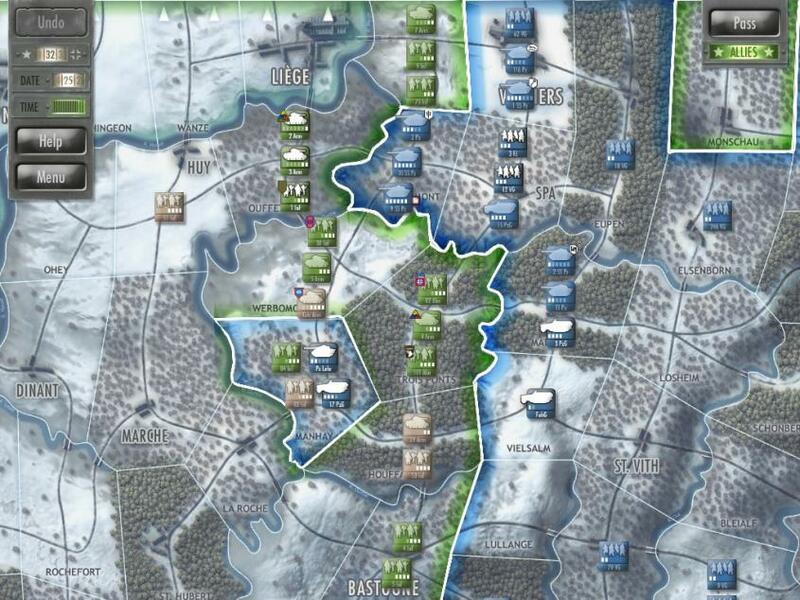 The Battle of the Bulge allows the player to relive the German counteroffensive from the perspective of either the Allies or the Axis, and through either a short or long scenario. The short scenario, “Race to the Meuse,” includes the first three days of the battle and can be completed in about half an hour. The long scenario, “Battle of the Bulge,” follows the first week or so of the campaign and can take up to two or three hours. In the game, the player takes command of division size units (e.g. 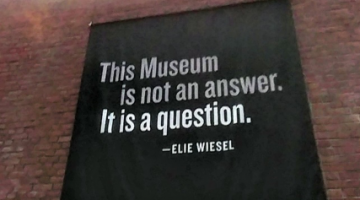 the 101st Airborne, the 116th Panzer division, etc. ), and determines their movement around the battlefield. The game is broken into days that last from 6 am to 6 pm. Within each day, players are given a random number of turns that are determined by behind-the-scenes dice rolls. The game board may look imposing, but the gameplay is easily accessible to anyone who has played a game of Risk. Combat is determined by under-the-hood dice rolls, which allow players to barrel into the game without having to learn a complicated set of rules. The iPad is particularly suited to this style of game because it gives players a bit of the tactile feel of playing an actual board game without having to clear a coffee table or clean up after aggressive dice rollers. Generally, the goal of the Axis player is to drive their forces as quickly as possible to the Meuse River, and then protect their advances from attack by Allied reinforcements. 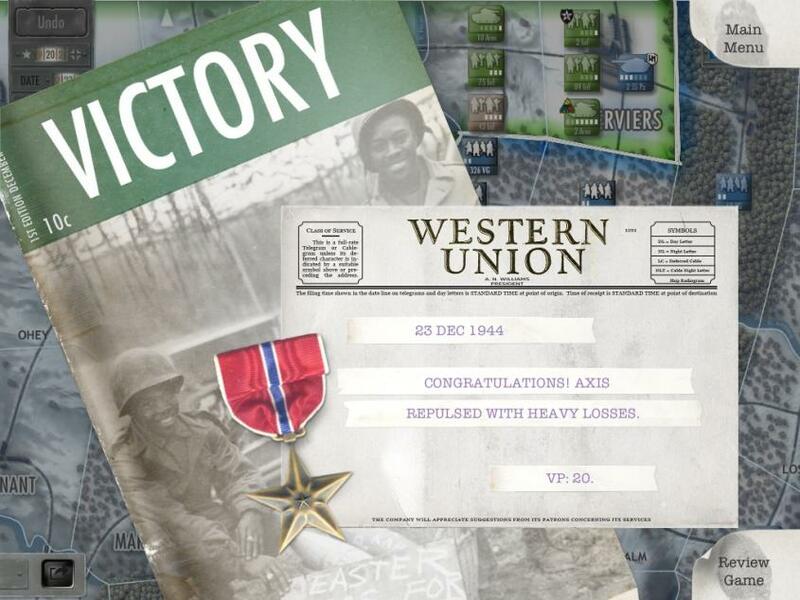 The Allied player’s goal is to play a spoiling role by delaying, or, if possible, halting the Axis advance before they are able to achieve victory. While the game allows the players to make their own decisions regarding the movement of units, these decisions are couched in the historical realities of the actual campaign. These realities can either help or hinder the player’s cause. For instance, the game begins with the Axis surprise attack on December 16, 1944, but on the morning of the attack Axis armor was delayed by a traffic jam. This means that Axis players in Battle of the Bulge cannot use tank units in their first three turns. Additionally, as the campaign enters its later stages, Axis players must contend with gas shortages that limit the movement of their armor. Axis players are helped, however, by the presence of commandos behind enemy lines (Otto Skorzeny’s famous English-speaking German soldiers), which they can use to delay the movement of Allied units. On the Allied side, players are helped by extra reinforcements and air support, but like their historical counterparts they must wait several days for new forces to arrive and for the skies to clear. 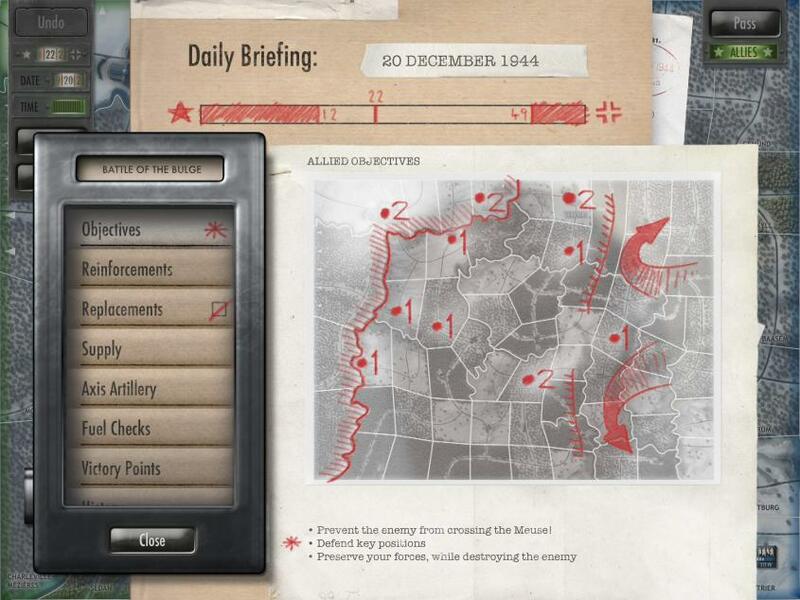 The presence of these accurate limitations means that players must pay attention to the game’s historical narrative, which is delivered through a “Daily Briefing” before each day. 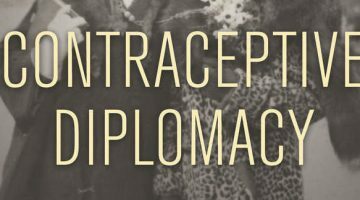 These briefings include information regarding reinforcements and supplies as well as a short history about the real life events for that particular day. 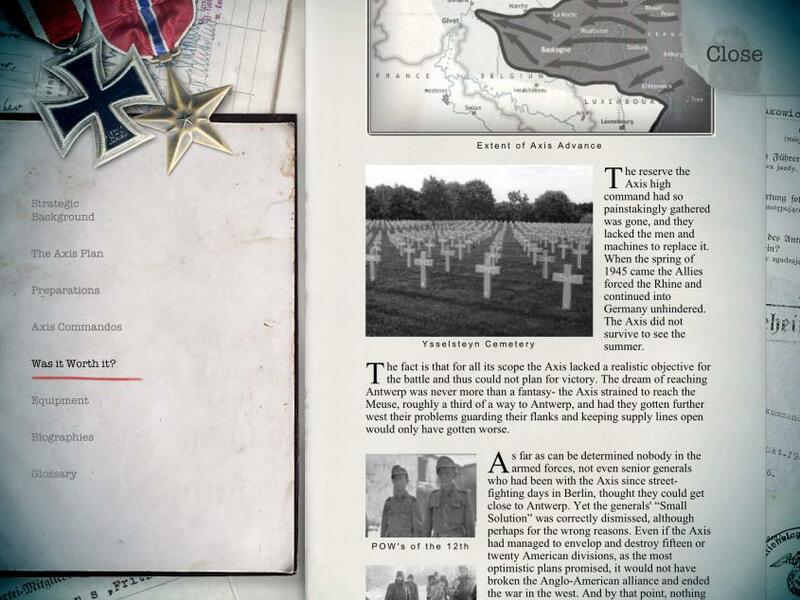 The short histories provide players with an opportunity not only to learn about the actual event, but also to compare their strategy with the strategies pursued by generals on both sides of the conflict. 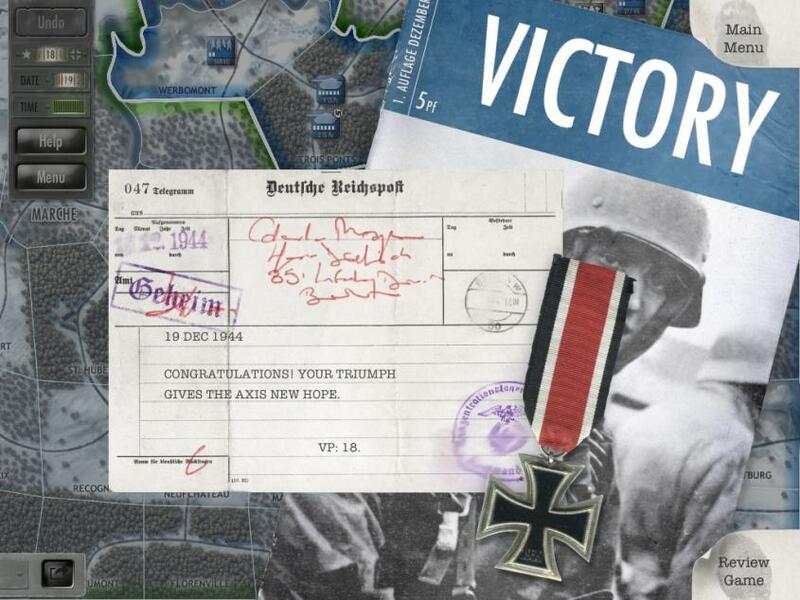 In my multiple play throughs of the short and long campaign, I learned that one of the keys to victory is keeping a close watch on the in-game calendar, which provides a shorthand description of the details listed in the “Daily Briefing.” This information is particularly useful for Allied players, as they can use the schedule of reinforcements and resupply to plan out the path of their retreat and determine the timing of their counterattack. Thus, the history in Battle of the Bulge is not merely window dressing. It can mean the difference between victory and defeat, and the players who ignore it do so at their own peril – or at least the peril of their digital army. One might say that this level of attachment to the historical narrative would predetermine the outcome of most matches, but in fact this potential problem is mitigated by two variables: the decision making of individual players and the game’s turn mechanic. The game offers two levels of artificial intelligence for single players to face off against, and these computer opponents can put up quite a fight. I never felt that I played against the same strategy twice. In addition, players can face off against friends in “face to face” matches (what old fogeys like me call “hot seat” matches) where they pass the iPad back and forth, or challenge each other online through Apple’s Game Center. The turn mechanic adds an extra layer of variability because players are not guaranteed a certain number of turns each day. This feature adds to the excitement, particularly near the end of each day, when players are not exactly sure how many turns they have left. This leads to a bit of brinksmanship, where opponents attempt to delay their final moves so that their enemy will not be able to respond. 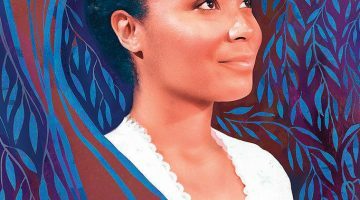 Only a few minor flaws hold up an otherwise stellar production. 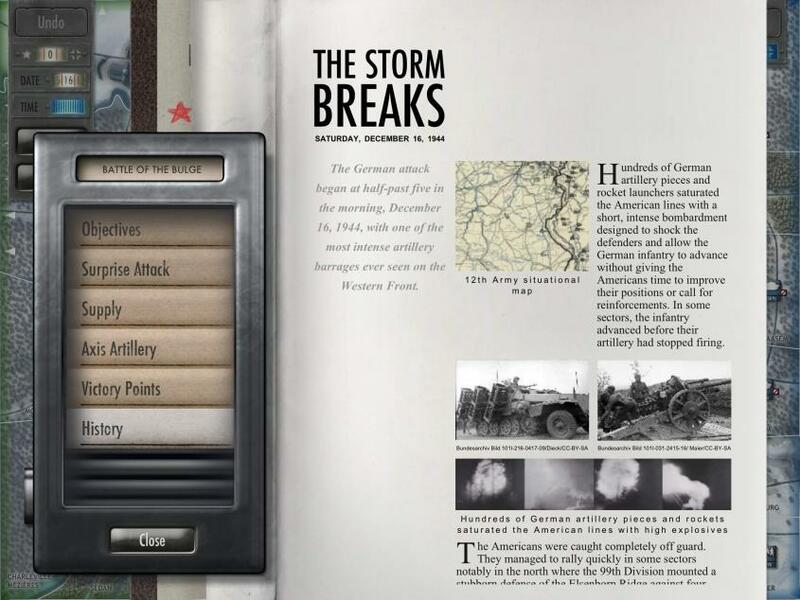 The game’s historical narratives, particularly the background history available in the main menu, contain several typos that include mistakes with punctuation and between singular and plural pronouns. The teacher in me also wanted to see a short, recommended reading section or bibliography for players who wanted to learn more. On the point of replay value, the game does not yet include additional scenarios, or the means to easily modify the game’s preconditions and rules. The addition of this sort of feature may be too much to ask for a small studio like Shenandoah, but it should be considered for their upcoming game on El Alamein. In conclusion, Battle of the Bulge is a game that matches a challenging tactical simulation with an excellent historical narrative. This sort of package would be considered a bargain on a console or computer for $30 or more. The fact that the game is available on a tablet, and for a scant $10, adds a great deal to Shenandoah Studio’s achievement. It is perhaps the only mobile game that I would forgive students for playing in class.